This is a summary of some of the parameters that I find are necessary in order to be fairly guaranteed snow down to sea level in Ireland. Forecasting snow is notoriously tricky, as anyone on this forum will attest to, and as we're on the edge of an ocean, with no proper observations upstream, the task is made all the more difficult. However, if most or all of the parameters below are at least forecast to be met in the model output then we can at least have some certainty. By far the best forecasting tool is a sounding (vertical profile of temperature, humidity and wind), as in one image it gives a complete snapshot of all the vertical parameters listed below. Looking only at horizontal charts of one or two layers (e.g. the surface and 850 hPa) is usually not enough to give a good picture as you can miss many subtle features between these two levels. Forecast soundings for each model are available on meteociel.fr under "Sondages" while the actual observational soundings from weather balloons are available there under "Sondages obs altitude". Throughout the whole year most of Ireland's rainfall is actually melted snow, with the freezing level obviously varying widely throughout the seasons. What we're looking for in winter is that freezing level to come down close to the surface so that the snow has a chance of making it down without melting. But the temperature and moisture profile of that surface layer have a big influence on melt rate. For a given temperature profile, drier air there will inhibit melting due to sublimational cooling off the surface of the snowflake. Thickness refers to the vertical depth of the layer between two pressure levels. The hypsometric equation says that this thickness is a function of the average virtual temperature of the layer (virtual temperature is the temperature plus the latent heat stored in its water vapour). Cold, dry air will have the lowest virtual temperature and hence thickness, while warm, humid air will have the highest. The most common thickness quoted (but the least useful) is that of the level between 1000 and 500 hPa (the bottom ~5.5 km of the atmosphere). This gives a first guess of the possibility of snow, but its usefulness is limited due to so many other factors at play within various sublayers of that layer. But as a rule of thumb; if this thickness is under 522 decametres (dam, 5220 metres) then snow is favoured over rain, while under 516 dam it's guaranteed (because the whole layer is likely to be subzero in that case). Some say that 528 dam is what we need, but this is only true in the case of a deep isothermal layer near zero (an approaching upper frontal zone) overrunning a shallow sub-zero surface layer. In this case it would mean heavy snowfall, but in the case of showers, 528 is way too high. The most useful thickness is the 850-1000 hPa one as this shows what the lowest 1-1.5 km of the atmosphere is like. If this layer is cold and dry then snow will be favoured, so a thickness of 1290 m or less is the magic number. Above 1300 m usually means snow is less than 50:50 likely, except in the case of a warm front precipitating into a cold surface layer. The warm frontal layer near the 850 hPa level will add thickness to the overall layer, even though the temperature profile below it could be mostly sub-zero and supportive of snow. Again, this is where a sounding is crucial. 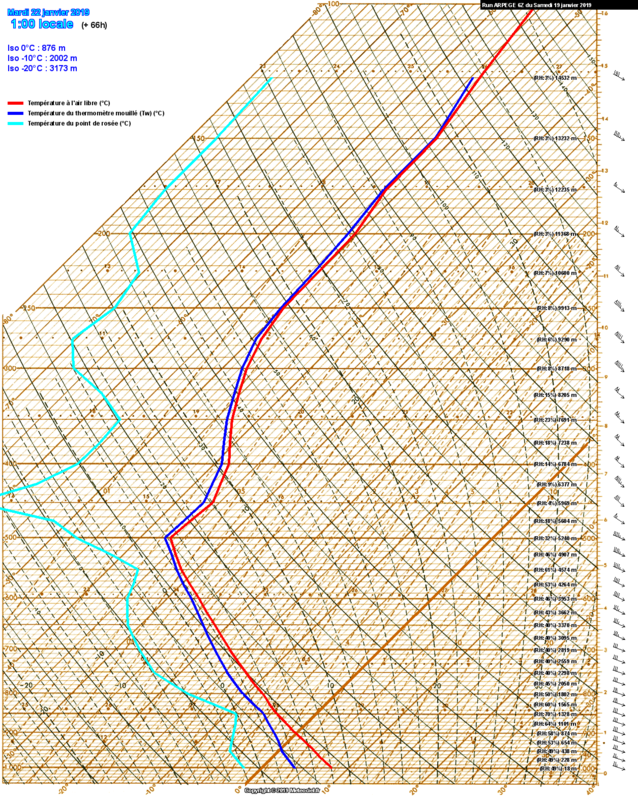 The 700-1000 thickness is useful in conjunction with the 850-1000 as it shows what the lowest 3 km is like. 282 dam and below guarantees snow, while 286 dam means you have to look at more layers to see what's causing the thickness (e.g. a frontal zone again). This is the most widely quoted chart on the forum when it comes to snow, but it too comes with caveats. It's good for standard surface pressure and a showery setup (temperature falling rapidly with height), and a value of around -8°C or lower is the magic number. The 850 hPa level is likely to be at around 1300 m in this scenario, and with a lapse rate of around 6.5 °C/km, the temperature at the surface is likely to be at around 0, depending on the surface (e.g. sea) temperature, and snow should stay solid. For these showers to form over the sea the temperature difference between the sea and 850 hPa should be 13 degrees or more, so in this case a sea temperature of at least 5 °C should kick off the showers. This is why we here in the east like a cold northeasterly (e.g. Dec 2010). A cold northwesterly usually picks up too much moisture (dewpoints too high) on the 1800-2000-km sea track from Greenland, so in most cases it can fall on the wrong side of marginal for snow to sea level, or wet snow can result. Cheap Atlantic muck. In the case of non-standard surface pressure the 850 hPa temperatures gets used incorrectly. Every hPa increase (decrease) of surface pressure from standard 1013 hPa raises (lowers) the height of the 850 hPa layer by a little more than 8 metres. So if surface pressure is 1030 hPa, the 850 hPa level will be raised by 17×8=~140 metres. This is 140 metres extra that snow now must survive through, which, at a typical terminal velocity of around 1 m/s, will take about 2-2.5minutes. That's a long time for a snowflake to stave off melting. On the flip side, low surface pressure lowers the 850 level by the same amount and shortens the potential melting time. So purely saying "we have -8 uppers" means nothing without an idea of surface pressure or 850 hPa heights to go with it. In the high-pressure case, that temperature is higher up, so at a standard lapse rate (ignore the subsidence inversion for a minute) the temperature on the ground will be about +3 °C. We would therefore need more like -11 °C to give 0 at the surface. Of course, snow is unlikely anyway with pressure that high. For the low pressure scenario, the opposite is true and we could get by with only -5 °C uppers. Snow can also fall with T850 as high as -1 °C if there is an established deep cold surface layer, preferably over a snowfield. If the air is not above zero (or only a shallow layer above zero) from 850 down to the surface then snow can survive. Again, a sounding here is key. The above values are the marginal figures, so we want them to be lower to be guaranteed. Check the 950 hPa relative humidity charts for an idea of the dryness of the lowest layer and how turbulent mixing will effect surface values. Things like windspeed, sunlight, precipitation rate, etc., all have some effect too. For maximum evaporational cooling we need heavy precipitation falling into a dry surface layer with low windspeed. This can cause cold rain to turn to snow, but remember, as evaporation occurs, the wbt is increasing, so it can become marginal unless the air is plenty dry enough. Snow falling during the day will melt more quickly than at night as the flakes absorb uv radiation and sublimation increases. As we head into February and March this effect becomes bigger. Also, daylight hours are increasing and the ground will become warmer. Low windspeed prevents mixing of warmer air from below, keeping the upper air colder. Obviously local effects come into play too. Heavy showers can have strong downdrafts that drag down colder snowy air from above, so an individual shower can give snow when the parameters above say no. Elevation also has an effect, as Mountainyman shows. Temperature falls by about 0.7 degrees per 100 metres, but check the blue wbt curve on the meteociel forecast soundings to see at what height it becomes about zero. That's your snowline. In the example below it's at around 438 metres. Last edited by Gaoth Laidir; 19-01-2019 at 13:12. Yes quiet descriptive of what's required. Well done. Possibly should put in as a "useful weather link" so it doesn't get lost or whatever works best. Brilliant and incredibly useful post. Thanks GL. The other night it snowed the Dew point was -2.8c here but today its 5.1c booooooo! Could a mod please fix that stupid typo in the title? I can't! 'cheap atlantic muck' brings snow to elevated areas of the west and northwest so i wouldnt be so dismissive of it in the context of your east coast bias. See my reference to mountainyman, in Sligo. Lots of muck is nice snow in elevated areas. My post was referring only to snow at low levels. Last edited by Gaoth Laidir; 19-01-2019 at 17:55. I know in March 1979 there was a fall of snow close to a foot in the East Offaly, Laois , Kildare area. Maybe more places were affected not sure. February 1855 - Phoenix Park recorded lying snow from the 7th to 23rd. According to some old Met Office data, possibly the coldest month on record in Dublin after December 2010. Winter 1878-79 - A very cold and snowy Winter but no known individual events. February 1892 - Cork recorded a depth of 46cm in the third week. February 1895 - Extremely cold and snowy. On the 24th January large quantities of rain, sleet and snow accompanied the south easterly gale in the south of Ireland. At Ballinacurra near Cork the measurement (of snow when melted) on the 24th was 52 mm and on the 25th 19 mm. At Seskin the total amount of snow on the 25th and 26th yielded, when melted, 47 mm of water. On the 25th, the wind strengthened to a gale in the south of Ireland, when there were heavy falls of snow covering the ground to 30 cm or more, with drifts of 300 cm or more. Over a large area of Ireland railway traffic was stopped owing to the heavy snow. During the period 28th January to 3rd February, the low maximum temperatures prevented the snow which had fallen during the preceding week from thawing to any considerable extent. Little fresh snow fell during the week. 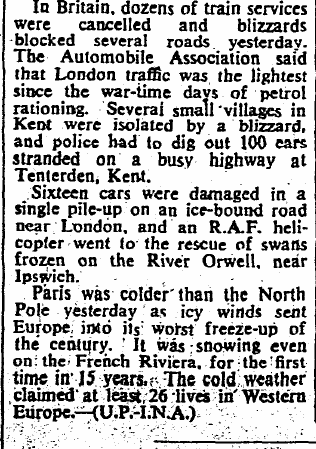 February 1955 - Plentiful wintry showers and outbreaks of snow. Snow lying on the ground at Dublin Airport from the 18th to 27th February. February 1956 - This would have brought some lake effect snow into eastern counties of Ireland but it is unknown how much. It was a severely cold spell (included Dublin Airport's only February ice days until 28 February 2018). 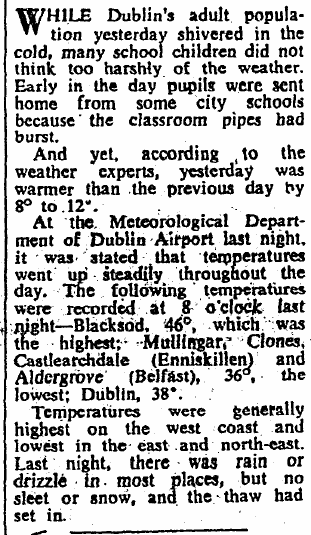 Here's some Irish Times articles on the cold below. February 1978 - perhaps the most notable blizzard for southern and southwestern parts of Ireland. 26cm at Cork Airport on 20th February 1978. January 1985 - a bitter easterly wind mid-month which brought ice days for some and heavy snow showers. Rosslare recorded a depth of 18cm on 18th January 1985. January 1987 - a very heavy lake effect snow event with ice days even as far south as Cork (Cork's coldest days on record). February 2001 - a northerly/northeasterly brought heavy snow showers to the east of Ireland with depths surpassing 10cm. 75cm of snow was measured in the Mourne Mountains on 27th February 2001. December 1978/January 1979 was also in Ireland yes. Casement Aerodrome recorded a snow depth of 26cm during this spell. Claremorris and Cork Airport also recorded depths of 16cm and 15cm respectively. There was the February 1979 easterly too. There's a good few more mind you in the archive which can be seen in the Snowfall in Ireland document below or the Newspaper Archive (I currently have access to the Irish Times Archive if you want articles). 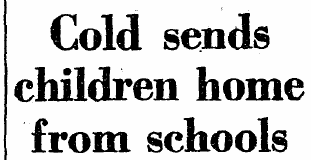 Thought you'd might find the second file (The historic record of cold spells in Ireland) interesting if you haven't seen it already. Last edited by Donegal Storm; 03-02-2019 at 10:40. I remember flying in that snowy spell. My first time to witness such cold air. The plane took off in a flash and climbed effortlessly. Amazing flying over Meath with the snowy landscape below and not a bump in the calm air. The only downside was trying to clear the rock-hard snowy ice off the wings preflight.